Fellowship of Hope began in 1970 from a small group formed at Associated Mennonite Biblical Seminaries. This group felt called to live together as closely as possible, called to simple living, and called to learn together what following Jesus could mean in life. This intentional Christian community and friends located in south central Elkhart in a transitional neighborhood where some members continue to live and where our meeting house is located. FOH rapidly evolved into a community with a common treasury and extended households where we learned to live together and be transformed as followers of Jesus. 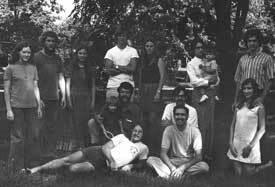 By 1978 there were more than 50 adult members with lots of children and a number of intentional neighbors. Fellowship of Hope Church began in 1978 as another way of being a part of FOH. While the common treasury was disbanded in 1985 we continue our commitment to be a faithful body of believers. In 1981 the present meeting house at 1618 South Sixth Street was purchased. In the fall of 2007 we began to work at improving and updating the exterior of the meeting house. In 2009 we built a new entry complete with handicap elevator to make our building a more welcoming place to be together. Today we seek to be a Peace Church practicing hospitality and compassion in the neighborhood of the meeting house and with whoever we encounter during our ordinary workdays. We are committed to seeking and promoting lives of peace. We are learning to promote the good news about Jesus which includes transformed individual lives as well as renewed and reconciled communities. We desire to be good caretakers of the world we live in. We continue to grow into the new alternative community that congregations of God's people are called to be. We commit ourselves to be a fellowship of hope.